Ward Cartoonist: What a Nimrod! The scriptures describe Nimrod as a "mighty hunter. "* I wonder how he feels knowing that his name is now associated with a certain kind of loser--I also wonder how mighty hunters feel. 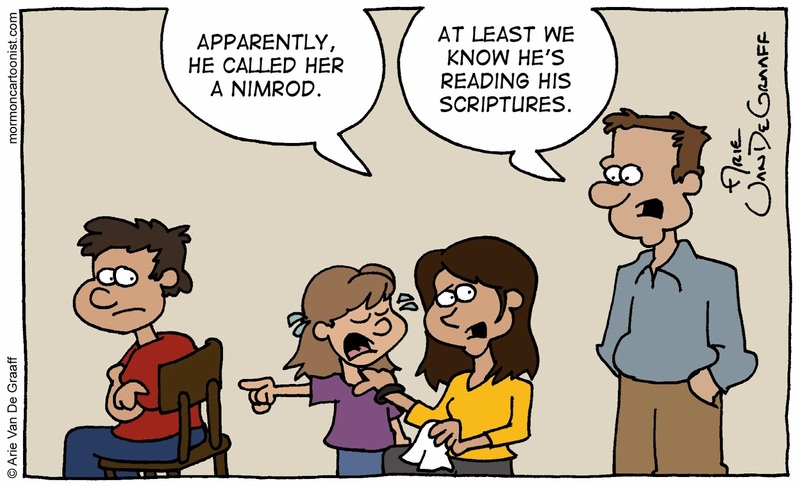 Nimrod was both a hunter and a builder... both useful. I'd not be insulted by being compared to someone of his accomplishments. When you think about it, there's plenty of names in the Book of Mormon that are insults in our day, like Moron or Laman. Reading the Book of Ether with it's constant reference to the Land of Moron usually results in a bout of giggling at my home.